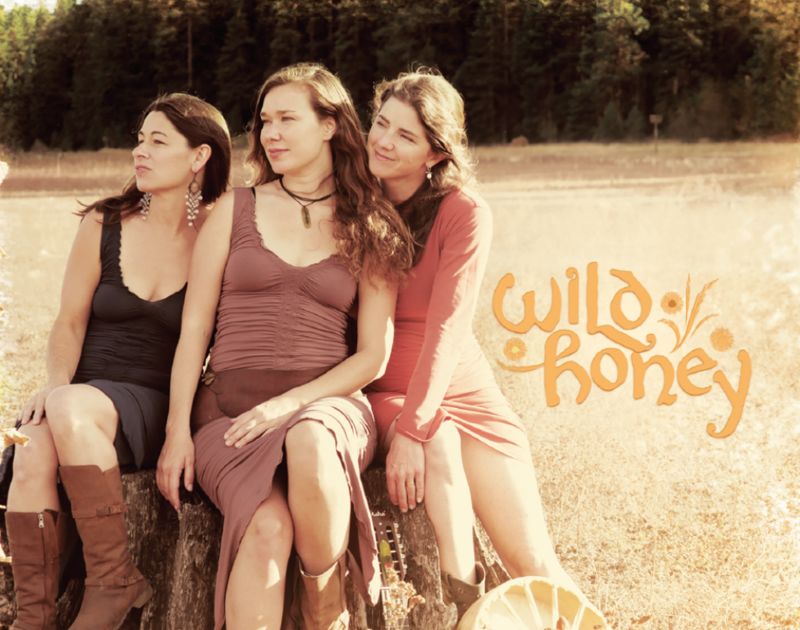 Wild Honey is a female vocal trio based right here in Southern Oregon. They specialize in performing folk songs from all over the world. While attuned to tradition, the trio holds a deep reverence for the evolving nature of world music, allowing old songs to emerge in new ways through their synergy and luscious harmonies. This afternoon we sat down with these talented women to explore the magic behind the making of Wild Honey. Welcome Peia, Megan and Cyrise, and congratulations on your new album! Megan: Thanks so much, Shields. This first recording project took nearly 2 years to complete, so we are thrilled to finally be sharing the album with you and our Southern Oregon community. Because we sing songs in such a variety of styles and varied languages, it really takes a while for each piece to sink deeply enough into our bones, and to find the comfortable spot for it to nestle into our collective creative space. It feels really satisfying to send this gift out into the world at large. I’ve just listened to your album and am struck by the unification and depth of the voice. I intentionally say voice and not voices because it sounds like one voice to me. Peia: Thank you. We’ve worked really hard over the years to cultivate a good blend and unified sound. Our independent voices are each quite distinct in their quality so this is not always easy to achieve. We all come from different parts of the country; Megan from the Great Lakes region, Cyrise from the West Coast, and myself from the North East. These accents certainly show up in our rehearsal process, one that involves a lot of attention placed on the shape of our vowel sounds, which might seem rather arduous and boring but is the key to creating a good blend. It’s all in the details! Cyrise: We’ve had quite a few giggles in rehearsal coaxing the regional accents of our voices into alignment. With the release of your album, when can we hear you in Ashland? Megan: We will be performing our CD release concert at First United Methodist Church on Saturday, April 14th at 7:30 PM. It feels particularly special to offer our show here as it was 6 years ago that we first performed together in this sanctuary, calling ourselves The New Trio…we didn’t even have a name yet! Cyrise: Yes I remember putting it out to our audience that we were searching for a name. Soon thereafter, one of our dearest friends, Elise Peters (who owns the local store Heart and Hands) was struck with the inspiration to call us Wild Honey and we decided that we loved the name. It just suits our personalities and what we do so well. We’re song gatherers, essentially, each of us collecting our own nectar to bring home to share with one another. To begin with, I am really interested to hear how Wild Honey came into being. Was this an intentional group formation? Megan: When Cyrise moved up to Ashland from the Bay area in 2009, we hired her to direct the first season of the Rogue World Ensemble. At the time I was also singing with a small Balkan women’s group, which she joined. Over the years this group evolved and eventually one day, via an audition for the Rogue World Ensemble, Cyrise discovered Peia. Cyrise: I remember receiving your phone call about the Rogue World Ensemble while I was wrapping picture frames in newspaper and boxing them up for my move to Ashland from the Bay Area. I remember thinking “Who is this passionate woman?” I was drawn to your enthusiasm and the way you approached music with a love of detail and a huge heart. I remember first hearing Peia sing and feeling like we had found our missing piece. You can get so much a sense of someone’s heart from their voice. She felt familiar already, I had a sense that Megan would feel the same way. Megan: The growth of the trio has really been a very relaxed one, a side project that each of us began to prioritize as it became clear to us that our vocal chemistry and personal connection was unique and well, precious, in a way. Peia: I maintain an independent touring career so Wild Honey tends to move forward in bursts of collaboration when I am in town. We have learned to be efficient with our practice time. And we carve our time for longer retreats where we can have more of a deep dive with the music and each other. Tell us about the dynamics of your group. Megan: Musical groups can arise and dissolve pretty quickly for a variety of reasons- creative conflicts, communication challenges, differing priorities, ego battles. One of the best things about Wild Honey is that each of us stands in our place with a deep respect for one another and ourselves. We’re actually quite different people in many ways, bringing a variety of strengths and artistic ideas. Cyrise: From the beginning of our working together I noticed the way we engaged in the exchange of our ideas about a piece of music. We know that what we have is special so we hold the relationship of our triad in very high regard. No ego battles. Peia: Most often I sing top voice, Cyrise sings bottom voice and Megan is in the middle. But we’re actually all quite flexible and we like to share leads and switch up harmony parts. We will often do this based on the quality we feel the song calls for. I would love for you to talk more about the intimacy and connection that is created when singing together. Megan: Singing a cappella is a vulnerable experience. It takes bravery. Our voices can shift and change with our mood and health, the weather. It’s raw and real and there has to be a lot of honesty in the process to achieve the artistic result we all want. The key is to imbue our honesty with kindness, love and respect. We not only want to reflect back to one another that which we need to work on, cultivate, but also encourage one another’s confidence in the process of refining their skills. This can be a delicate dance and one that many musicians, I believe, stumble at in their dedication to the product, the sound. Sometimes artists are ruthless at the expense of their collaborative relationships. This is not to say we don’t aspire for our best but that we work hard at keeping all our priorities in view. Peia: Singing together in general is just a fundamental human practice. It’s a tool for creating connection between people. As Megan said, the voice is a very vulnerable place and it lays bare our most interior world. I think what we do is really refreshing right now when so many of us experience a world of overstimulation and excess. What we offer in our performances is a kind of beautiful minimalism. A respite. When things are stripped away and we meet one another in a state of true harmony, this is intimacy. What are some of the questions that you have learned to ask one another in working together? Peia: How are you singing that vowel? What’s the shape of your mouth? We have to focus considerable attention on proper pronunciation of all the languages we sing in. Pronunciation is absolutely key to achieving a respectable degree of authentic sound. Megan: We keep in mind the meaning of the song, remembering to reconnect to it again and again. Sometimes, when you’re in the process of getting pretty analytical with phrasing and pronunciation we’re at risk of creating distance from the heart of the piece. Cyrise: We discuss dynamics and phrasing a lot, where we want to draw back and inward and where we want to place the most emphasis either via emotion or volume. Megan: We can have a tendency to slow down a fair amount because we like to hang out in the harmony of the chords we create… they’re delicious! But then one of us will kick us back up into tempo just like giving a horse a nudge. You each have had your own life long relationship with music. Will you each please take a moment to share a little tidbit of what has inspired you? Cyrise: Music has been a friend for as long as I can remember. I recall the gratitude I felt as a young child hearing a song on the radio that articulated my heart back to me. When things were turbulent in life I leaned on music and poetry for support and sustenance. When I was about 8, my parents bought me a little microphone that allowed you to sing along with/through an AM radio signal. I crack up now remembering hours in my room tuned into KFRC from the SF Bay Area and hearing my own voice coming out of the speaker with John Lennon, Kool and the Gang, Paul Simon, Stevie Wonder and Diana Ross. I would lose track of time…now that’s what I call a “flow state.” My family contains many musicians and performing artists. My heart just gravitated to their field…they offered opportunity and encouragement. Now I am getting to share my love for music with my 7 year old son Jonah. Megan: My parents were both very creative, bohemian hippies in the best sense of the word; passionately involved in the politics and changing social landscape of the 60s and 70s. Music during these eras was a powerful voice of the people and they certainly found themselves within this community. Beatles, the Stones, Hendrix, Pink Floyd, Joni Mitchell, Bob Dylan… so many monumental artists were constantly played in our household, alongside jazz and classical and blues and country. I really had an incredible music education as a child. During my teens (the 80s), I recall spending countless hours hanging out with my favorite records; Michael Jackson, Prince, Annie Lennox, Madonna, Peter Gabriel. All this said, I actually never considered pursuing music as a career path in any way until I moved to Ashland at 30 years of age. My dad was a music major at Wesleyan and in his pursuit to bring his own music career to life, he secluded himself from the family. He was really a lone wolf in a way. When it came to making music together in our family, this didn’t come around very easily. Much more appreciators than creators. It wasn’t until I felt the power of singing in community through a Village Harmony vocal camp in 2007 that my own musical journey ignited. Many of your songs have a deep and timeless feel to them. How do you go about choosing the songs you perform? Cyrise: We are blessed to work with teachers who offer songs from their traditions that they feel inspired to share with us. As we learn a song we respond to it intuitively….what do we feel as we sing it together? How does it sit in our 3 voices? What is the story/poetry of this song? We tend to gravitate to our favorites and they quickly become part of our repertoire and others we may persist with until we crack the code for our group and start to embody them. Others will float down the river and we will revisit them in time, or perhaps they move on to find another voice. Sometimes while we are in our separate orbits and I am listening to music, a song will jump out and present itself as a perfect song for us. For me it is a physical feeling of already knowing how it will feel to share this song with Megan and Peia, a sense of knowing what will fit and feel well. Megan: We tend to gravitate to songs that embody women’s stories, naturally. Often there is a grief or sadness which underlies the harmonies and deeply moves us. We feel a sense of responsibility at times to sing songs that carry an important message that we resonate with; the power of music to heal, the need to hold trauma with sacred hands, and the importance of advocating for a more gentle and respectful relationship with the earth for example. The songs we choose to sing also feel like they’re carrying a potent jewel of a moment in time that’s important to continue to let shine through our voices. Cultures are created and lost via music. There are countless examples of ruthless governments whose efforts to take control of a people included not allowing them to engage in their songs and dances anymore. Why? Because they are the sacred container in which we hold our sense of belonging and shared humanity. Can you each share a favorite song that you are enjoying right now? Peia: I am really loving this 18th C. Sean Nós (old style) song that I learned on the west coast of Ireland this past summer, and just brought into our repertoire. We’ve been enjoying the challenge of wrapping our mouths around the quick moving Gaelic phrases, practicing our nimble vocal ornamentation and the dark Irish humor of the story. Cyrise: I am really enjoying the early North American shape note song Parting Friends. The lyrics are so deeply melancholy, images of travelling through a dark wilderness and the troubled heart that must part ways with a deeply loved friend. The harmony stirs my soul like a winter landscape! Megan: I am really enjoying the process of developing our own arrangement of Tracy Chapman’s “Mountain of Things.” I can recall the moment when I was listening to her classic album, Fast Car, a couple years ago sewing Halloween costumes with my mother. I hadn’t heard it in a while and on a whim had pulled it from my shelf. When I heard this song, I instantly had a vision of Wild Honey singing it. The message is a powerful one right now, about over-consumption and the painful and vast abyss between rich and poor. The rhythmic pulse behind the song is also really juicy; we’re having a blast creating the body percussion with this one. It’s challenging us because our feet are moving at a counter-rhythm to our voices…I can feel the dendrites growing in my brain as I practice!! You each have had the opportunity to travel and sing internationally. Could you please share some of your best advice in regards to this universal theme of music? Peia: I like to tell folks that it’s never too late to start playing music or to sing. It’s one of the most raw and rewarding expressions of human heart and creativity. Music lifts the spirit, brings people together and gives us the ability to share and remember our stories. I didn’t come from a musical family and I didn’t grow up playing instruments. I couldn’t read music until much later in life but I loved to sing. Thankfully my mother and grandmother encouraged my desire through providing me with voice lessons. It wasn’t until I was almost 30 that I really began playing an instrument. It’s never too late!! Megan: I want to share an experience I had at a traditional Georgian feast called a supra when I was in Tbilisi, Georgia studying with a traditional ensemble called Zedeshe. These feasts happen relatively frequently in Georgian life and they’re an amazingly beautiful celebration of their culture. At the head of the table is a person identified as the tamada, who leads the feast via a series of thematic toasts, often beginning with God, then family, homeland, friendship, and anything else they feel inspired to encourage attendees to speak to, or sing to, or dance to. At this moment in time that I’m recalling, the theme was homeland. As I listened to each person that felt inspired to offer their thoughts on this subject (followed by big swigs of homemade wine), I felt an incredible upwelling of grief. What became clear to me was a deep sense of sadness that the culture from which I came didn’t maintain the openness, acceptance and cultivation of our musical selves from birth like so many other countries around the world. In Georgia and beyond, the music is a very natural, integrated staple of daily life. Children sing, dance, and pick up instruments alongside their family members without any hesitation. Naturally there are those who show particular talent and promise and therefore pursue music as a career, but everyone is encouraged and included in the general use of music as a form of cultural celebration. In our culture there are so many messages about who is musical and who is not. I’ve known too many adults who carry wounds in their heart from hurtful words from a parent or a friend who laughed at their dancing or told them “don’t quit your day job” when they would sing along with the radio. So I say…it is your birthright to feel the joy of singing and dancing and don’t let anyone tell you otherwise. If you tear up just reading this, then go to your heart and set her free. What is it like for you to imagine that many of the songs you choose may have been sung hundreds, perhaps thousands, of years ago by men and women who you will never see or know? Cyrise: It is an incredible feeling to be in the midst of singing one of these ancient pieces and suddenly in my mind’s eye a vivid picture appears of the landscape of that region, or a person I will never see in this lifetime. We can only begin to imagine what is carried in the repetition of these songs. It connects me across time to the ancestry of our human community. When the song is over and the silence falls, I feel that a connection and even a conversation has transpired through our singing between places and people who are separated by time. Megan: Singing songs that are ancient is an experience that, for lack of better description, gives me chicken skin! They’re like musical fossils that capture a moment in time and in this magical way continue to breathe and have life force so long as they’re sung. I feel such gratitude for the opportunity to sing them with Cyrise and Peia. Again, when I was in Georgia we went on a somewhat arduous hike venturing up to a small church set alone on a hilltop. The story goes that a peasant put hundreds of sacred Georgian orthodox chants in a wheelbarrow covered by firewood. He pushed it up to this church to hide them away during Soviet occupation when they were destroying such manuscripts. During my stay there, we actually learned a couple of these chants that were later uncovered after Georgia regained its independence. There’s just something so indescribable about singing sacred song like these…I feel a unique sense of being just a small part of a long line of voices keeping our stories alive. Tell us about some songs you are doing from modern composers. Peia: As song gatherers and folk musicians we remain connected and responsive to what is happening in the world around us. Certain modern folk songs just speak so eloquently of the times in which we are living and the challenges we face. These songs often point to parts of our psyche or culture that desperately need to be brought to light and transformed. When one of these rare gems grabs us, we like to bring it into our repertoire, interpret it through our creative lens and allow the song to speak for itself. Megan mentioned Tracy Chapman’s “Mountain of Things” earlier…this is an example of a modern song that we feel has a strong message we need to hear right now. Tell us more about the reception to your new album and how anyone who cannot come to your concert can buy the album online. The reception has been wonderful. Our fans have been so patient! We’ve been singing and performing together for nearly 6 years and people would consistently ask about an album. I’d like to give a big shout out to Jim Abdo at Brokenworks productions where we recorded our CD. He was so patient and generous throughout the project. You can find our album online at CD Baby, Bandcamp, and iTunes, but of course, the best place to get ‘er is at the show!